The thousand-year-old Tibetan text Bardo Thodol, translated as "Liberation Through Understanding in the Between", and known widely by its popular name, The Tibetan Book of the Dead, is a Buddhist text about death, reincarnation, and achieving liberation from suffering. For the purposes of this blog, in which I try to objectively examine the risks to humanity's continued survival, this book is sort of useful. One notable exception: the Bardo Thordol is intended to aid the deceased in achieving liberation, whereas I'm much more concerned about helping the living and liberating humanity from the threat of extinction. Every living being is a Buddha-in-the-makiong. Image: David Lindemann. Quote: The Tibetan Book of the Dead (p49). 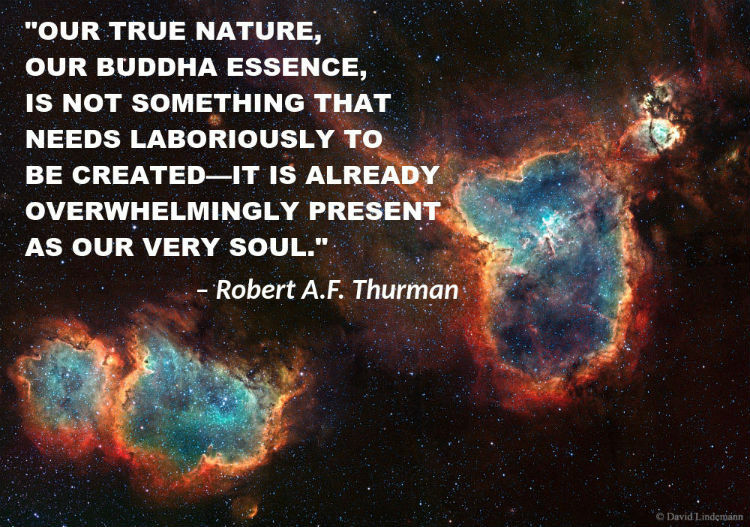 What does it really mean to have a "Buddha Essence" and to pursue the ideals of Buddhist practice? Buddhism is all about eliminating suffering—not just your own suffering, but the suffering of every living being as well. And for that reason, it's a philosophy geared towards making the entire world, or universe, a better place. The goal isn't just to seek enlightenment for the selfish purpose of achieving Nirvana (though that is still the prime motivation in the Theravada school of Buddhism); the real task, the gargantuan task, is to seek enlightenment for the sake of bettering the lives of all sentient beings. This is sort of the core concept of Death by Cosmos: I'm motivated by the problem of avoiding catastrophes and making the future of humanity as good as possible for all future beings. And I see a huge blindspot in the form of various global catastrophes that could knock our species into extinction—catastrophes which, although unlikely to occur, the mere possibility that they may occur is so horrific (in terms of human suffering inflicted) that those scenarios should be avoided at all costs. "Realize that this independent network of nonabsolute, relative beings and things is fluid and malleable, open for creative development. If it's all a mutual construct, let's make it more beautiful. Everything is open for transformation... [but] their openness to transformation implies some danger that they can degenerate into negative configurations, causing suffering to living beings. But that danger is more than offset by the possibility that everything can be transformed toward limitlessly positive configurations, realms of joy and fulfillment for living beings." Another teaching of the Buddha is that of perpetual change—culture, wisdom, species, civilization, and even personal identity are all subject to change over time, and nothing can stop that. Whereas other religions often offer us something permanent to cling on to (ie. the gods), Buddhism offers us no such reprieve. Instead, we can only find refuge in accepting the permeable, ever-changing selflessness of our existence. But this also points to our limitless ability to make things better for everyone, and the goal of Buddhism is to do just that—to improve the lives of all living beings. We can avoid global catastrophes, both natural and human-made, and make the world a better place to live in for everyone. And even better than that, we can extend outwards into the cosmos—inhabit other worlds, build giant space habitats—in order to bring more humans into existence, more beings capable of seeking and attaining enlightenment. 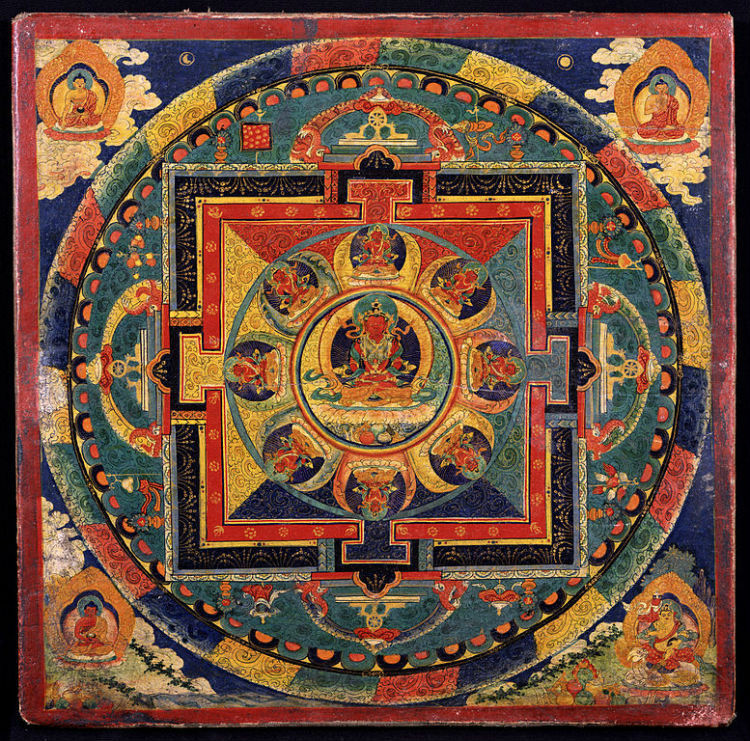 A 19th-Century Tibetan Mandala of the Celestial Buddha Amitābha. Image: Wikimedia Commons. "Driven by ignorance, ordinary beings structure their universe into an ordinary world maintained by their ordinary imagination, encoded in language and imagery. Liberated through wisdom, enlightened beings are free to restructure their universe to respond to the needs of the many beings, transforming entire worlds into Buddha-lands." Attaining a peaceful world in which all beings can become free of suffering and personally fulfilled/enlightened is going to require re-imagining the way we do things now. Maybe every system we currently have in place needs to be re-thought in order to create a better world. If it's ever possible to replace capitalism with a system that would bring about less suffering and more individual fulfillment, then it would probably be a good idea to do just that. This transformation of society isn't something to be accomplished in a short span of time, either. Buddhist practitioners expect this task to take an infinitely long time, during which infinite numbers of beings will come into existence and achieve Buddhahood. And since there may be infinite numbers of universes in this vast cosmos, there should be plenty of room for everybody. This vision of infinity is sort of like the plight of Sisyphus, doomed to roll a boulder up a hill for all eternity only for the boulder to come rolling back down again over and over. But this isn't a fault of Sisyphus—it's an action set in place by the gods and destined to repeat an infinite number of times, completely out of his control. In Buddhism, on the other hand, it's possible to make some forward progress without having the boulder roll backwards each time. As long as we're diligent in our pursuit of wisdom and enlightenment, the boulder won't roll backwards on us—the only problem being that the hill itself is infinitely large, and will never end. 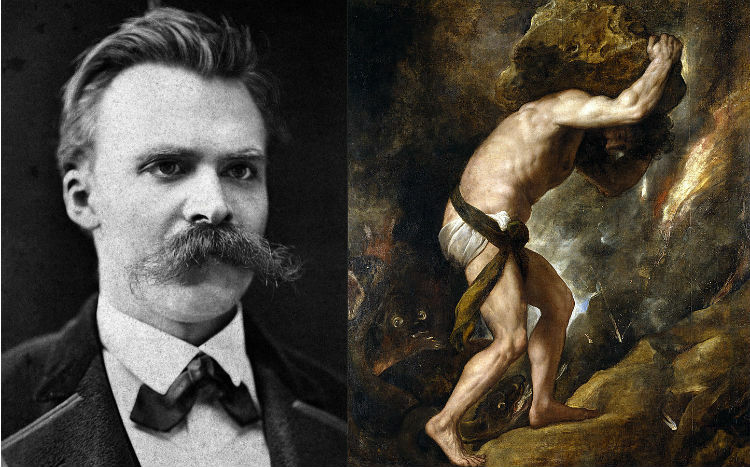 Nietzsche, the God-killing Buddha. Image (left): F. Hartmann in Basel. Image (right): Sisyphys (1548–49) by Titian. The key difference: the Sisyphean circumstance is set in place maliciously by some higher power, whereas the Buddhist circumstance is simply a recognition of the nature of reality. In Buddhism, we're not cursed by any higher power; the curse is the nature of existence (and therefore suffering) itself. This makes Buddhism a humanistic philosophy—the responsibility is all on us—whereas god-based morality says that our fate is out of our control. Your preferred belief system is a matter of taste; different people find different belief systems more comforting. But I'm of the opinion that the god-based morality is counter-productive, because it suggests there's nothing we can do to avoid global catastrophes. For example, the Book of Revelations predicts a future apocalypse in which every human being will die and go on to either burn in hell or live in a heavenly paradise. The reality, of course, is that there's a lot we can do to avoid such a scenario from ever taking place—and that we should also be ethically obligated to do avoid such scenarios wherever possible. Now, let's finally get into what the thousand-year-old Tibetan text actually says about death, reincarnation, and achieving liberation from suffering. The basic tenets are this: through careful lifelong practice, a practitioner of Tibetan Buddhism can achieve liberation from suffering after death and become a Buddha. If this is not possible (if one has not practiced sufficiently), then one may otherwise achieve a favorable rebirth (reincarnation) in a body of one's own choosing (the book even discusses 'how to choose an ideal womb'). However, each outcome is dependent on the deceased having studied the Bardo Thodol while alive. Both of these options—liberation or reincarnation in an ideal body of one's choosing—are exponentially better than the worst options: being reincarnated as a lower life form or, if you're a really bad sinner, ending up in a sort of Tibetan Hell (which is by far the worst thing one could imagine). The hierarchy of sins here follows a pattern. If you lived a life driven by hate, you'll end up trapped in Tibetan Hell. If you lived a life of greed, you'll end up as a sort of ghost, trapped between realms. If you lived a life of ignorance and stupidity, you'll be reincarnated as some kind of animal, which all have limited faculties of understanding (and thus are unable to achieve liberation). After that comes humans, which are said to be unshackled from the extremes of hate, greed, and ignorance. Being born a human is thought of as a hard-won treasure, having taken perhaps billions of former lifetimes of slow momentum down the path of enlightenment in order to achieve. It's only once one is reincarnated in a human form that they're finally able to begin practicing Buddhism in earnest. Interestingly, these three deadly sins of Tibetan Buddhism are also what lead to most of the problems for our civilization here on Earth. Hatred leads to wars and potentially the use of nuclear weapons, which could effectively render Earth uninhabitable. Greed leads to unabated capitalism and the environmental destruction we see around the world today, and which just might kill us all off within a few generations. And perhaps worst of all, ignorance renders us unable to look at our actions as a civilization objectively, unable to see the error in the current status quo. 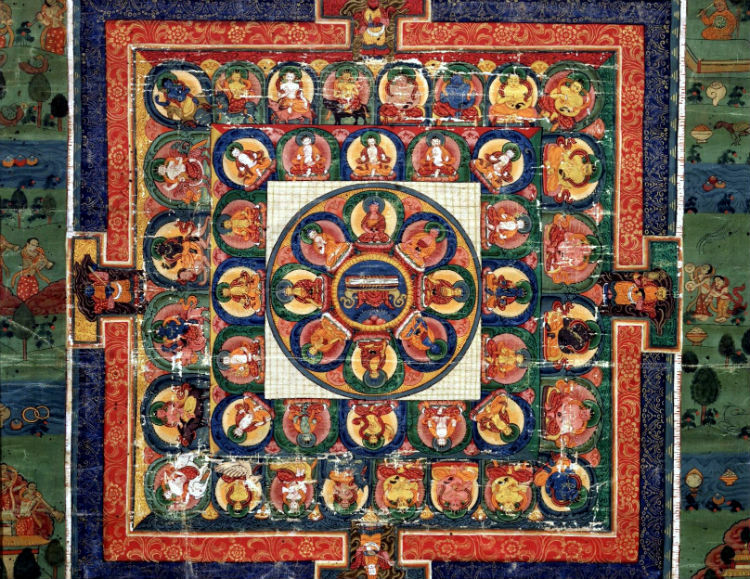 Another Mandala depicting Buddhas of the Tibetan canon. Image: Wikimedia Commons. Perhaps it makes more sense to imagine Tibetan Hell as a place we create here on Earth—a world filled with suffering—if we're unable to overcome our destructive instincts (which are supposed to be the driver of animals, not enlightened humans). Perhaps we can imagine future generations of humanity as ghosts, wandering in some apocalyptic between-realm of a hopeless future. And perhaps our extinction as the only species on the planet capable of attaining wisdom and enlightenment would once again give Earth back to the animals, who are incapable of following the path of Dharma. "Contrary to some contemporary misconceptions, Buddhism is not at all anti-intellectual. The intellect is a vehicle of liberation; it is the source of wisdom, after all, and wisdom is the only faculty that can enable you to achieve liberation. Meditation, love, ethics, none of these alone can bring about enlightenment without wisdom." As humans, we're extremely lucky because we're the only creatures on this planet capable of attaining any sort of wisdom and cosmic understanding at all. And this enables us to potentially change the course of the entire universe around us, given cosmic time-spans. Practictionersr of Tibetan Buddhism believe that it takes an incredible number of reincarnations in order to achieve enlightenment, or Buddhahood. But the fact that one has been born a Tibetan, or a human in general, and especially if one is already predisposed to pursuing Buddhist practice, means that one has already completed the vast majority of their long journey towards Buddhahood. Every being alive today has already gone through countless lives, and many still have countless lives to go before attaining the ultimate perfection. This isn't too different from the evolutionary force that got life to where it is today, and which has enabled our human bodies and minds to exist at all. It started with the simplest, single-celled life forms at the time of the primordial Earth. Then, untold millions of generations later, the steady change of evolution over time resulted in the world we see around us today—more than 7 billion conscious humans, each capable of comprehending at least some of the world, however big or small that understanding may be. When it comes to the actual substance of the Bardo Thodol, we can ignore the woo-woo stuff about gods and demons and hell-realms and choosing an ideal womb for rebirth, and instead focus solely on what's useful to us. The Tibetan concept of the between stage of life and death allows us to take a step back and examine our own lives from afar. I think that's the hidden purpose of this Book of the Dead: to make us thing about our own mortality so that we can overcome our fears and live our lives well and purposefully. A 13th-Century depiction of Akshobya and the other five Wisdom Buddhas repeated in the background. Image: Wikimedia Commons. This is also something we should do as a civilization. We need a Book of Death by Cosmos in order to come to grips with the possibility that our entire civilization might die off, just as many civilizations have done in the past. And we should also think critically about what we've observed to be a lack of alien life in the cosmos. Is the answer to Fermi's Paradox that all of the aliens are dead? Because that sure wouldn't help our odds of surviving. Perhaps a way to ensure our survival is to have the foresight to see the really bad events that might occur and find ways of avoiding them before they come to pass—at all costs. We all want our offspring to be able to live fulfilled lives, and the same for their offspring, and so on and so on. All it takes is a modest investment in studying and avoiding existential risks, both seen and unseen, to ensure a bright and liberated future for every future being. I've been traveling in India for a month, and during this trip I've taken up a strong interest in Buddhism. I haven't visited a monastery or become initiated or anything, I've just tended towards reading a lot of Buddhist texts and learning a lot about Buddhism over the past month. Increasingly, I see its positive worldview oriented with my own. I share a key principle with Buddhism in that I want to make the world a better place. I don't know how to most effectively do that just yet, but for now I'll keep blogging about it—and hopefully share a few thought-provoking ideas long the way. I don't want the world to go down in the flames of some disaster we could have avoided, however unlikely it is that such an event may occur. I want all beings to be liberated, free to live the lives they want, and free to pursue wisdom and personal fulfillment. Too many people don't have these opportunities, so I started a small fundraiser in support of an NGO called Room to Read. I'm attempting to maintain a travel blog (though having two blogs while in a developing country with limited internet is not easy! ), and hopefully some interested readers can be charitable enough to contribute some small sum to the cause of improving literacy and girls' education in the developing world.